New Nitrogenerator with the following capabilities and characteristics: DYF series nitrogenerator is a high purity nitrogenerator, suitable for supplying nitrogen-for the production of ampoule, vial and infusion in pharmaceutical industry, also it applies to foodstuff, biochemistry industry etc. It includes three sub-systems: compressed air post treatment system, PSA pressure transforming absorption system and air fine filtering and sterilizing system. Features as follows: 1. The purity of nitrogen reaches 99.99% without hydrogen and bacterium, meets the requirement of international pharmaceutical "GMP" standard. 2. Adopting the latest PAS nitrogen generating process, unique design of absorber structure and completely polished stainless steel in order to make sure of production of high-purity nitrogen (purity is higher than international standard). 3. Adopting international famous brand components to assure the long life of machine. 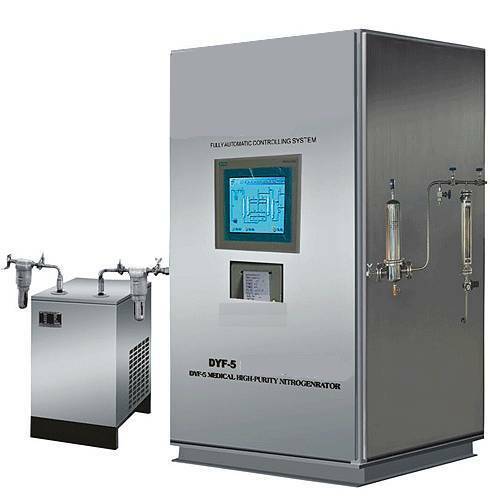 4.Adopting MITSUBISHI PLC and KY-2N analyzer, the whole system is under PLC automatic control and monitor, so that it doesn't need on-duty workers to watch and operate. According to the customers requirements, we can design advanced options: Man-Monitor-Interface, PLC, transformer digital design, all kinds of parameters display in-time dynamically, automatic monitoring.